OK, it’s time to come clean. I am a serial cat offender. If this gets out generally I will probably be thrown into Bengal Hell, so do keep it quiet, alright? The saga of Bengal Blunders goes back seven days exactly. 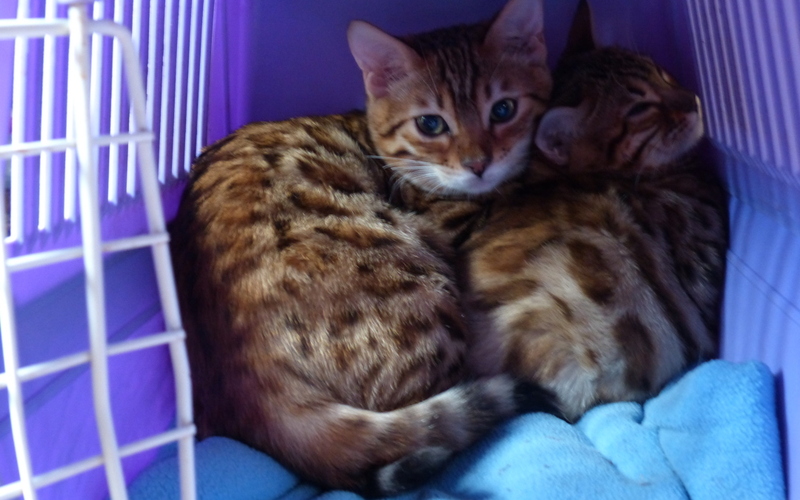 I had arranged to bring not one, but two Bengal kittens back from the breeder and dutifully did so. One was for Da Boss and the other had been bought for my daughter by her boyfriend. The two kittens had been brought up together and were half sisters so they travelled to our house together in the same basket. 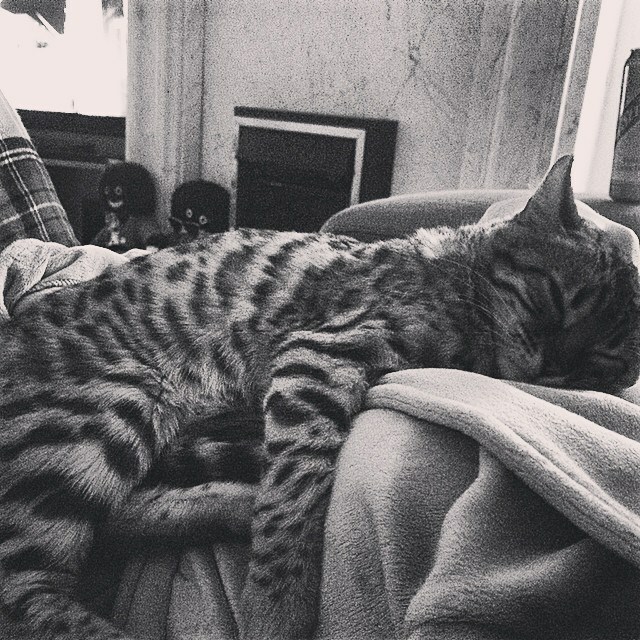 All went well and the two kittens were kept together upstairs in a quiet room until the evening when our daughter arrived with her boyfriend. That was when the disasters started. When it was time to go CG (my daughter) walked downstairs with her new kitten. She was trying to soothe it and comfort it in her arms when we stopped at the top of the stairs. That was when the kitten spotted an open top window and leapt out of CG’s arms and through the window in a flash. We rushed downstairs and hunted around the garden furiously but not a sight nor sound of the kitten anywhere. We then spent the next hours combing the bushes and visiting neighbours to let them know that there was a missing kitten. The next day all local vets, the RSPCA and even the police were informed. A national website “Animalsearch” was contacted and we settled down to a daily routine of searching garages, talking to passers by, checking on local gardens and so on. It was not looking good at all. Then two nights ago just as we were getting ready for bed the bell went and our neighbour stood there in her dressing gown and wellies announcing that she had just spotted the kitten. It had been up to their big windows and had then run under their car. Mayhem ensued. For the next hour we scuttled around in nightwear and waterproofs as we tried to corner that darned cat – all to no avail. She was far too quick and cunning to let herself get caught. Eventually we put down food and went inside. Within five minutes the food was gone so yet more was left out in the hope that this would encourage her to stay in the area. The next morning phone calls were made to virtually anyone who might have expertise in cat catching. Sadly the big organisations were of little use at all and so it was that eventually we were pointed in the direction of The Cats’ Protection League, a charity based about ten miles away. They lent us a cat cage and gave us instructions about food and setting the trap and making it like a den and so on. We planned to put it out that evening at dusk, but another neighbour popped round to say that they had just spotted the kitten in their garden and so we prepared the cage and then started our vigil. We had been warned that it might take a couple of nights, especially if the kitten was frightened, but we had to persevere. Now Da Boss is even less patient than I am, so the thought of waiting for several nights was almost like a new torture. Fortunately our little Bengal beauty was equally as impatient or hungry, because the trap snapped shut just ten minutes after we set it. Inside was the wildest most furious kitten I had ever seen. I know that it was fear causing it to leap about, but oh boy I was very careful to keep my hands away from those razor like claws. We brought it in and added more food and also encouraged her half sister to come over and say hello. And so things quietened down and I made the nicest phone call of the year. Within a quarter of an hour the two were together and this time every door and window was firmly bolted down. The kitten calmed down markedly and so I went off leaving Da Boss and the other twoto sort out getting the little kitten into a cat basket. It all went incredibly smoothly. Apparently the kitten simply walked into the basket, curled up on the blanket inside and went to sleep. So without further ado we took the pair of them home where they got a rapturous reception from CG’s boyfriend, whom I shall call Stu! Mightily pleased with myself I set off home for my supper. But when I got there Da Boss wanted a word. But all is well that ends well – CG and the lost cat snored away happily when finally united!